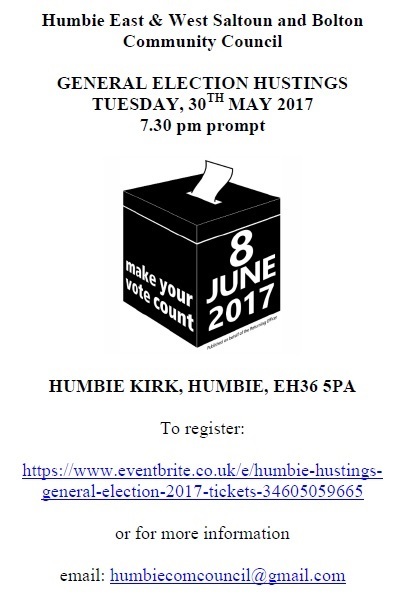 Our Community Council is hosting the Humbie Hustings – General Election 2017 on the evening of Tuesday, 30th May. All are welcome. This entry was posted in Announcements, Events on May 18, 2017 by Admin. 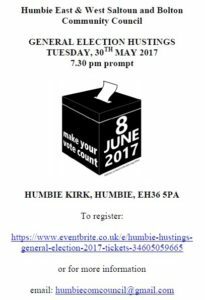 Thanks for promoting the Hustings. All five candidates (one from each of the main parties) and an independent candidate standing for election to the Westminster parliament will be present to answer questions invited from the audience. This is an ideal opportunity to hear from the individual candidates and to learn how they propose to represent you if elected.